Well hello! I am here to report that yesterday’s run went pretty well: 4.25 miles at an easy pace. Well, easy until I spotted THAT GUY running ahead of me on MY PATH. He didn’t appear in my sight until I completed the third mile, and, when I spotted him about a quarter-mile ahead of me, I told myself to ignore that he was even there. I let it go… for about 45 seconds…when suddenly the gap between us got smaller and smaller. I quickly assessed if I had enough power in me to not only outrun him but keep up the pace long enough to ensure he would continue to eat my dust. As I passed him, with flying colors I might add, I not only startled him as I flew by his right side, but heard a snicker uttered in between his gasps for air sounding something like, “she’s fast”. And that friends, is the reason we chick. Speaking of chicks, the rest of today’s post is for girls only. I know I have many male readers and while you are welcome to continue reading, I am giving you fair warning that you may not like today’s topic. Has anyone noticed that not enough is said about our periods in the healthy living blog world? I mean, the subject is touched upon but not often enough and I have a lot to say about it as well as have a ton of questions for my readers. In fact, I have so much to say on this topic that I think today may just be part one. As a little background, you should know that I dread my monthly visitor with a passion ever since I was a young girl. I suffered tremendously prior to the birth of my son in the form of horrendous cramps that lead to nausea, vomiting and sometimes even fainting. 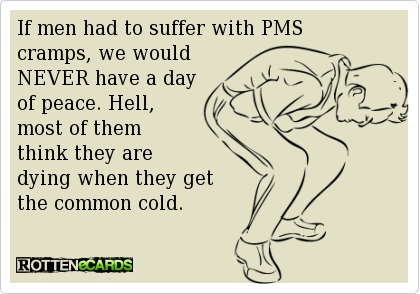 PMS, cramps, tampons. Not fun. BUT- Getting our cycle every month is a sign of health. When something goes wrong in our cycle, be it spotting, arriving too early, too late or not at all, one needs to pay attention and figure out the problem. I have suffered from secondary amenorrhea two separate times in my life, which, in nonmedical jargon terms, is simply the absence of your period for at least 3-6 months. 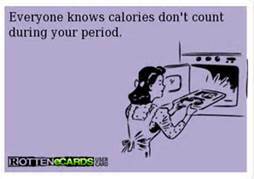 My body is extremely sensitive- if I don’t balance my calories properly for the amount of exercise I do, I don’t get my period. I will admit that the two times this little hiatus occurred, I kinda enjoyed it. I mean, I knew something was wrong but how the heck could you not welcome the opportunity to live PMS, cramp and tampon free? Please note that just because I am being honest does not make my way of thinking OK. It is not healthy to be without our cycle. Not only do we need it to be able to have children, our periods are nature’s way of telling us that everything inside is pretty much working according to plan. Amenorrhea often occurs as part of the Female Athlete Triad, which is a syndrome of three conditions that are interrelated: Energy Deficit/Disordered Eating, Menstrual Disturbances/Amenorrhea and Osteoporosis. For more in-depth info on the Female Athlete Triad, click here. Without regular menstruation, our estrogen levels drop increasing our chances for bone loss and stress fractures as well a host of other health problems due to the complete disruption of our body’s hormone levels. If you have been without your monthly cycle for three months or more, and know you aren’t pregnant, it is time to look into what is wrong. So. While it may appear super fun to be free from the Tampax, it is crucial to fuel our bodies properly to ensure we suffer each month in order to know all of our systems are functioning properly. But do we really need to suffer? I have learned over the last few years that consuming certain foods can help mitigate the negative side of menstruation. Slices of chocolate fudge cake and bags of salty chips are lovely when our PMSing brains instruct us to eat them but they do nada to make our uterus stop cramping. The tips below are based upon what has worked for me. The doctors never informed me that eating or not eating certain foods would alleviate my period problems. 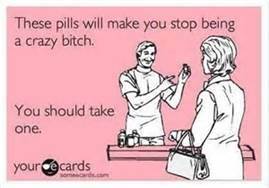 In fact, medical professionals are very quick to offer you some hormones in the form of a pill. My opinion, for what it is worth, is that treating cycle issues with a pill ill only mask the real issue and will not solve the actual problem. I learned by accident that becoming a vegetarian would work wonders for my menstrual cycle. The cramping we experience comes from our prostaglandin levels. Some people have higher levels than others. I assume I am one of those higher level people. Our body produces these series two prostaglandins from the essential fatty acids found in animal proteins. By eliminating or simply reducing our intake, we automatically lower our prostaglandin levels. Within a couple of weeks of not eating meat or poultry, not only did my PMS symptoms become nonexistent, my cramps were basically gone and the need to change my tampon every hour was no longer necessary. Increasing Omega -3 Fatty Acids will also help. Omega -3’s are found in cold water fish such as salmon as well as in our favorite little Chia Seeds and Flax Seeds. When I became a vegetarian, I naturally gravitated towards increasing my fruit and vegetable intake. The anti-inflammatory properties of fruits and veggies as well as the abundance of nutrients they contain all play a role in the reduction in cramping, PMS and at least for me, a reduction in the flow. 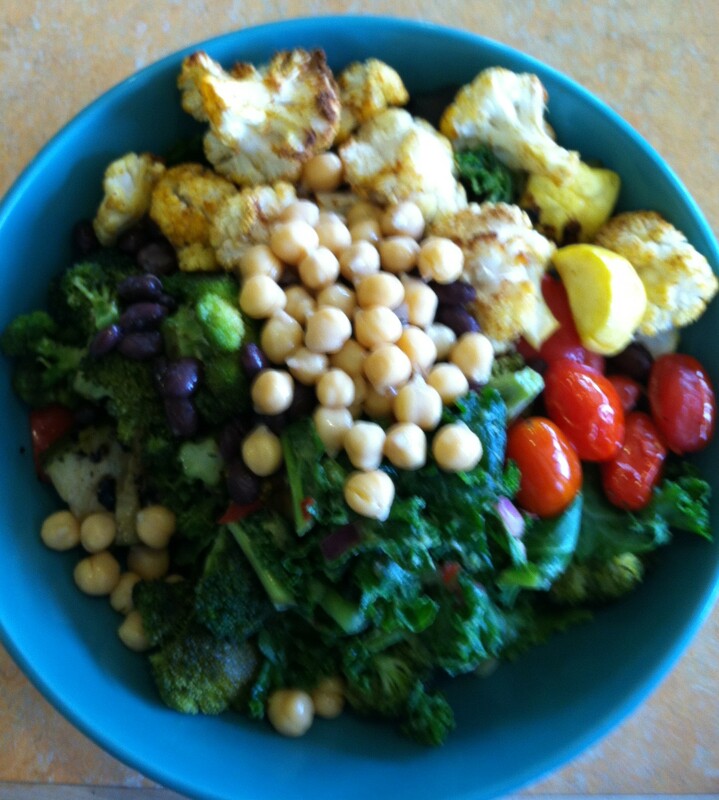 My lunch yesterday at Whole Foods – I am all about any excuse to load up at the Food Bar. 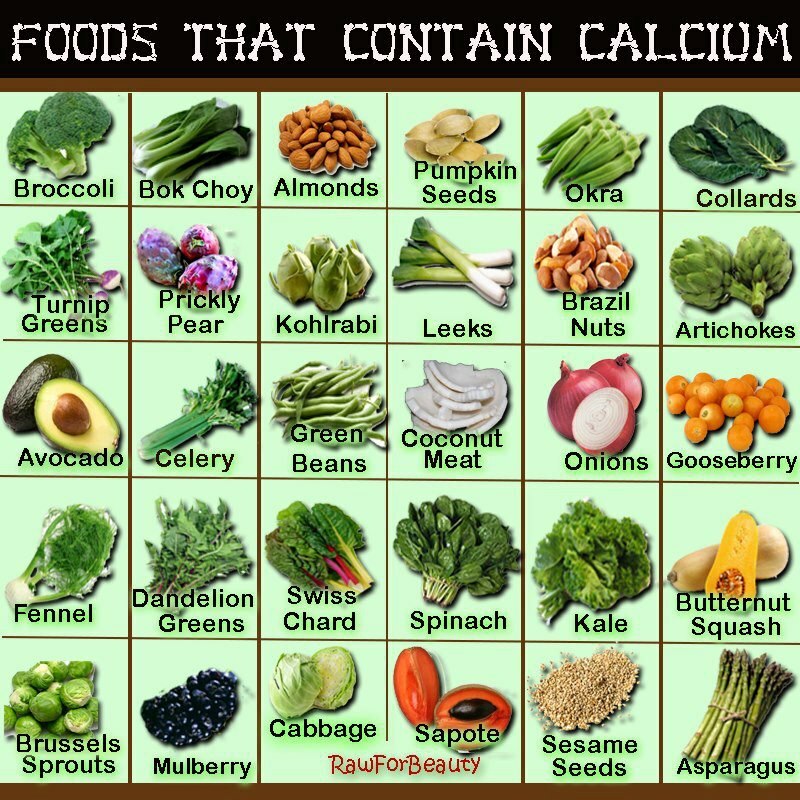 So here’s the thing – calcium has been known to assist in the reduction of menstrual cramps yet dairy products have been associated with increasing the pain. 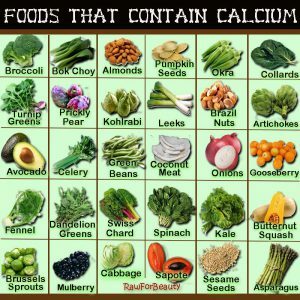 Who knew it was so simple to get calcium without having to drink milk and/or eat cartons of yogurt. Please Click here for more in-depth info on this subject including a more complete listing of the essential foods to eat and to avoid. There is so much more I have to say on this topic but it will have to wait for another day as I have a little boy to wake up and get ready for camp. Remember, without our annoying monthly visitor, we can’t have children. Let’s keep that in mind every 28 days. Do you suffer from painful cycles? How do you handle it? What are your PMS cravings? Have you ever had to run a race while having your period? It is my biggest fear! Which tampons do you use? Do you find some work better for you than others? Have you ever experienced amenorrhea? For how long? What did you do in order to bring your period back regularly? This is really handy! I’m already a vegetarian so that might explain why I don’t usually have terrible PMS! Yay for your new layout. It looks great 🙂 I find that working out really helps to curb the cramps. 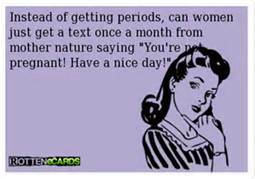 And I’ll be running two races this weekend with my period, wahoo! I once called 911 when I was home alone as a young teen because of the unrelenting pain, puking, and fainting, only to be told that was normal. Yikes. So I hear you. But I haven’t had trouble like that since I had kids. And I pull through the month with bar of superdark chocolate. Hooray!